3-25-19 -930AM Superman has been arrested for being an illegal immigrant as well as disorderly conduct when asked to show proof of citizenship. This occurred because Superman had to board Delta airlines after exposure to Kryptonite battery left him ground bound. Authorities said Superman became extremely belligerent to the Homeland Security as he was trying to make his connecting plane and then was taken into custody. Superman was born on Krypton but had no papers when he was raised by his adopted parents. The ACLUJ has taken up the defense of Superman. 3-25-19 -11:30 AM Superman has been released from prison as it appears he has given the address up of Thor another illegal immigrant with a long record of vandalism and disorderly conduct. 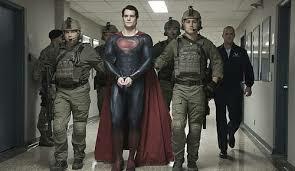 Thor was arrested promptly after Superman’s release from jail.